Urban areas are typically covered by impervious surfaces, such as footpaths and roads, which prevent rainwater from soaking into the ground. As a result, soil moisture is lower that it should be, making it more difficult to grow trees and cool the city. 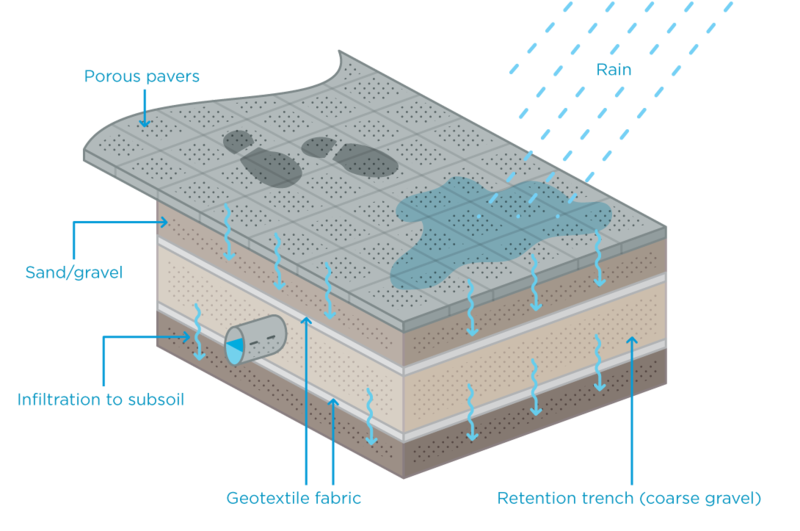 Porous paving – also known as permeable paving – allows rainwater to pass through and infiltrate the soil below. This recharges soil moisture and ground water. By directing stormwater away from the drainage system, porous paving also reduces flood risk. Porous paving comes in a wide variety of finishes and styles, including the porous bluestone paving which we are currently installing in Melbourne’s central city. Porous pavement allows water to pass through to the soil below.